Make your own career at the beach town and grow up as the entrepreneur. Start at the beach and deliver cocktails to your visitors and when you'll have enough money, move to a larger place. Have you ever dream to have your own business? 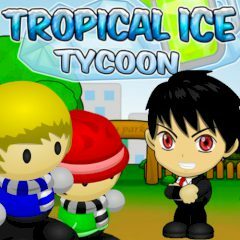 Then this is the best time to start your own ice cream business, grow and become a rich magnate in this fun-addicting management game Tropical Ice Tycoon. Just use your seed capital to purchase your first stand at the beach. Here you must be a hard worker, find new recipes to create more flavors and sell loads of different ice creams and cold drinks in the whole town to gain loads of cash. If you are ready, then go! Just remember that everything depends on you here. Could you believe that? Well, then show us that you are a real businessman!